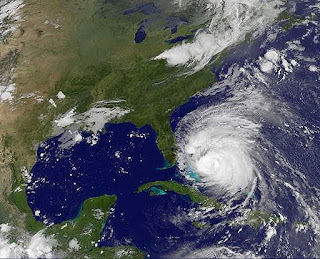 Big, blustery Hurricane Irene is barreling up the East Coast and she's got her eye on your home. And when she sits around your house, she sits around your house. Deadline Newsroom - Big, blustery Hurricane Irene is barreling up the East Coast and she's got her eye on your home. And when she sits around your house, she sits around your house. Kinetic Analysis Corp. expects Irene to cause as much as $13.9 billion in insured losses if she blusters ashore in full force. The Category 3 storm will be packing rain-lashing winds of more than 100 miles an hour, but the National Weather Service projects, before expected landfall this weekend around North Carolina's Outer Banks, the tropical cyclone could become an even more devastating Category 4 storm pushing winds at more than 130 miles an hour. A Category 4-level storm (before the Saffir–Simpson Hurricane Scale was developed) that hit the island port city of Galveston, TX in 1900, is the deadliest natural disaster in U.S. history. It killed 8,000 -- one in six residents -- and destroyed most of the buildings in it's path. Other examples of Category 4 storms include Hazel (1954), Carmen (1974), Iniki (1992), Luis (1995), Iris (2001), Charley (2004). Katrina, which hit the Gulf Shore in 2005 was a Category 5 at its strongest point, followed by Rita, a Category 3. If you are among the 16 million Americans in the path of the storm and haven't already evacuated -- and you should if you've been so advised -- it's time to batten more than the hatches. The Federal Emergency Management Agency and other disaster preparedness experts swear by the time-honored phrase "an ounce of prevention is worth a pound of cure" to rally property owners to the practice of mitigation -- preventing damage before it occurs, rather than cleaning up afterward. While a hurricane comes with a wind blown storm surge that can raise water levels and cause flooding, as in the Katrina storm, you want your home to be as intact as possible after the storm passes. The key is keeping Irene outside. "The trick to making a structure extremely wind resistant is to create a continuous connection path from the roof rafters or trusses all the way down to the foundation," says Cincinnati's master contractor Tim Carter of AskTheBuilder.com. FEMA says the broad, flat surface of the home below gable-end roofing makes a home particularly susceptible to high wind damage. If the framing -- rafters or trusses -- isn't braced, winds could blow off the roof and, once inside, blast out the walls. A professional roof inspection can indicate if your roof needs bracing. Hire only licensed, specialized contractors to do the work -- installing 2-by-4's between the roof rafters or trusses at each end of the house, as well as anchoring accessible roof rafters and trusses to the wall system. If you have to strengthen interior walls to hold the roof connections, that could mean removing surface covering to get at the framing, says the Natural Hazards Research and Applications Information Center at the University of Colorado. Double- or triple-glazed windows not only provide a stronger wind barrier, but add energy-efficient insulation, greater fire protection and noise abatement qualities to your home. However, even triple-glazed windows that aren't protected can offer easier access to wind borne missiles than permanent storm shutter (not the cosmetic variety) protected windows. For every $1 invested in wind shutters, at least $5 is saved in mitigated interior damages, according to the Emergency Service Center South, in Dade County, FL. Protected windows also reduce the risk of roof damage caused by high winds that manage to penetrate the building. Temporary, less expensive plywood covers are another option you can also use to protect sliding glass doors or large widowed areas. However, don't nail down the plywood, as frantic homeowners are often shown doing during televised news broadcasts of approaching storms. Fasten plywood panels down with screws or lag bolts long enough to penetrate the wall studs around the window, not just the siding or wall covering. For doubled-sided entry doors, add a heavy-duty dead bolt or replace the existing dead bolt with a stronger one. Add sturdy slide bolts at the top and bottom of the inactive door and replace all existing hinge screws with longer screws that extend further into the doors and frame. Likewise, shore up single doors and replace old or damaged ones with stronger ones, FEMA recommends. The garage door is another broad, weak surface. A skilled do-it-yourself home owner can perform the necessary reinforcement work -- adding girts across the back of the door and strengthening the glider wheel tracks. Also replace old or damaged garage doors with a stronger model. Reinforce it as well. Smaller single-car garage doors resist wind forces better than two-car garage doors and windowless doors are safer because glass is easily broken by high winds and wind blown debris. Remove or move trees so they are far enough away from your house that they can't fall on it. Anchor storage sheds and other outbuildings to a permanent foundation or with straps and ground anchors. Keep your property clear of debris and other items that can become wind-borne missiles. Visit FEMA's Hurricane page online for more information.